June 17, 2016 (Tony Cartalucci – LD) – After a torrent of multifaceted politically-motivated assumptions about the Orlando shooting which claimed the lives of 50 and left scores more injured, the extent to which the Federal Bureau of Investigation (FBI) interacted with the suspect, Omar Mateen, before the attacks was partially revealed. …the FBI’s Miami office opened a preliminary investigation, and over the next 10 months we attempted to determine whether he was possibly a terrorist. Something we do in hundreds and hundreds of cases all across the country. Our investigation involved introducing confidential sources to him, recording conversations with him, following him, reviewing transactional records from his communications, and searching all government holdings for any possible connections, any possible derogatory information. We then interviewed him twice. He admitted making the statements that his co-workers reported, but explained that he did it in anger because he thought his co-workers were discriminating against him and teasing him because he was Muslim. FBI Director Comey never elaborated on just how those informants interacted with Mateen. However, examining publicly available FBI affidavits from other investigations that resulted in arrests and prosecutions, it is almost certain the informants posed as terrorists with ties to Al Qaeda or the self-proclaimed “Islamic State” (ISIS). In two cases that unfolded just last years, FBI informants would be revealed to have helped plan attacks with suspects, suggest to suspects that they credit ISIS for the attacks (as reported by the Intercept), and even helped them in procuring weapons and explosives before finally arresting them. The results of such investigations are often high-profile counterterrorism news stories portraying the investigations as having stopped real attacks. Headlines like the Washington Post’s “Mass. man accused of plotting to hit Pentagon and Capitol with drone aircraft,” or the FBI’s own press release, “Oregon Resident Convicted in Plot to Bomb Christmas Tree Lighting Ceremony,” betray the fact the virtually every aspect of these supposed plots from A-Z were scripted by the FBI’s informants themselves with the suspects often being mentally unstable and technically/financially incapable of carrying out the attacks on their own – as evident in the FBI’s own affidavits. Protecting America, or Exploiting the Mentally Ill to Fill Quotas and Make Headlines? The FBI often opens these cases when suspects with questionable mental health make statements online or to friends, family, or co-workers indicating possible support for terrorist groups or terroristic aspirations. Comments could range from claims of belonging to a terrorist group or expressing a dislike of or a desire to cause harm to certain groups. Instead of recognizing a potentially dangerous, mentally unstable individual and getting them the help they need, the FBI instead proceeds with a process of entrapping them. They work often for months posing as terrorists, gaining the trust of the suspect, and leading them through elaborate, scripted terror plots. Image: What looks like a terrifying bomb filling the back of a van was actually constructed by the FBI and handed over to suspect Mohamed Osman Mohamud in Portland, Oregon. They also handed him a detonator he attempted to trigger twice before finally being arrested. The FBI – prior to the final staged bombing/arrest – would travel with the suspect to Lincoln County Park where he and FBI informants detonated real explosives. According to the affidavit, on November 4, 2010, Mohamud and the undercover FBI operatives traveled to a remote location in Lincoln County, Ore., where they detonated a bomb concealed in a backpack as a trial run for the upcoming attack. According to a counterterrorism official, El Khalifi “expressed interest in killing at least 30 people and considered targeting a building in Alexandria and a restaurant, synagogue and a place where military personnel gather in Washington before he settled on the Capitol after canvassing that area a couple of times,” the Associated Press writes. During the year-long investigation, El Khalifi detonated explosives at a quarry in the capital region with undercover operatives. He is not believed to be affiliated with al-Qaeda, officials said. One can only speculate what – over the course of 10 months – undercover FBI informants said and did with Orlando shooting suspect Omar Mateen and how that may have contributed to his final act of violence years later. The FBI’s practice of entrapping terror suspects has long been called into question. Until now, the damage caused by the FBI’s methods has been confined to locking away for years suspects who were otherwise incapable of carrying out actual terror attacks and instead required the attention of mental health professionals. With revelations that the FBI investigated Omar Mateen twice, including two interviews and the use of undercover informants over the course of at least 10 months, it appears that the FBI’s methods may have backfired – and it wouldn’t be for the first time. 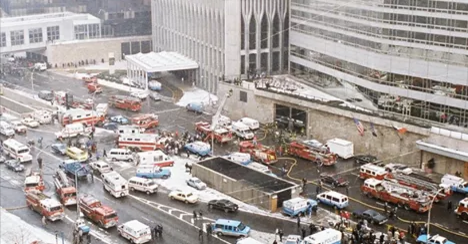 Image: Another FBI undercover investigation backfired in 1993 when suspects the FBI was helping build a truck bomb for ended up detonating the device in New York City’s World Trade Center, killing 6 and wounding hundreds more. The FBI’s role in the bombing was only revealed when an undercover informant who recorded conversations between himself and FBI agents, provided tapes to the New York Times. It is possible that contact with undercover informants posing as extremists may have radicalized or at the very least, planted the seeds for the violence Mateen would eventually carry out years later. The public, press, and America’s elected representatives must demand answers from the FBI regarding the nature of their investigation including who the FBI’s informants posed as, and what ideas they attempted to lure Mateen into their practiced methods of entrapment with. Did they suggest or help plan attacks on bars as they did with Alexander Ciccolo whom the FBI entrapped and arrested in 2015 according to the Intercept’s article, “Another “Terror” Arrest; Another Mentally Ill Man, Armed by the FBI?” Did they encourage or compound a possible internal conflict Mateen was struggling with regarding his apparent homosexuality? So far, the FBI refuses to make the details of their previous investigations public. They must as it constitutes a potentially essential key in ascertaining Mateen’s motives – and the FBI investigating a crime they themselves may have played a criminally negligent role in motivating constitutes a dangerous conflict of interests unacceptable if an impartial and honest investigation is to move forward. Instead of attempting to hitch our own various personal political causes to this tragedy, make it a priority instead to pursue and demand the truth. The villains we think we fear may pale in comparison to what may have truly sparked this tragedy – and exposing it may be the key to preventing the next tragedy. If the FBI played a role in radicalizing and provoking Mateen’s violence, and if the FBI is conducting hundreds of such entrapment cases all across America, how many other pending tragedies await the American public?